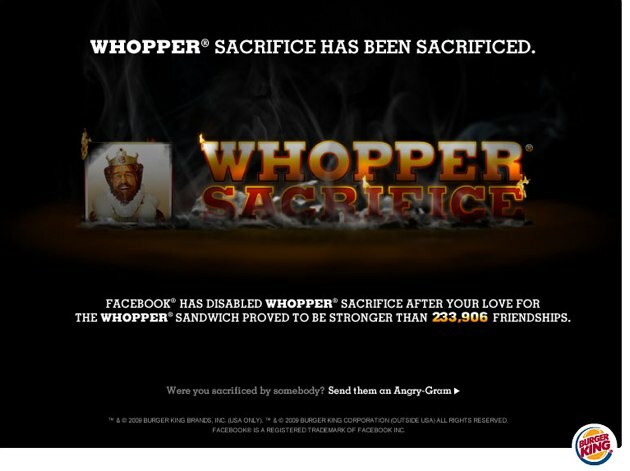 Burger King, through their insanely creative advertising agency Crispin Porter + Bogusky (see their recent Burger King perfume launch), launches a Facebook application that encourages users to remove Facebook friends. Sacrifice ten of them and you got a free Whopper. 233,906 friends were removed by 82,771 people in less than a week. Did anyone talk to the sales department before pulling the trigger on this? All that happened is the user being dissed got a message telling them, which helps the application spread virally. Without that feature the app is far less powerful. There is no real privacy issue here, just a policy decision by Facebook that people shouldn’t be notified when you remove them as a friend. Unless investor and partner Microsoft makes them do it, of course.